The 2nd Edition of The Real Estate Development Summit – West Africa is all set to take place in Accra, Ghana in October. With a vibrant growth trajectory across the Real Estate industry of all regions of West Africa, the summit comes with a dynamic and investment intensive backdrop. Commercial activity is relocating its preferred destinations across African destinations and with tourism on the rise, Africa is seeing a rapid increase in demand for new and modern commercial facilities, like new and modern offices, hotels and retail malls. This has created a huge demand for a variety of solution providers in the West African markets which not only require high-end suppliers but also service providers whose pricing is competent by market standards as well. This is also turning out to be the greatest challenge faced by developers and investors; to find suitable and sustainable suppliers with competent pricing and quality while still maintaining their international standards and practices is the real challenge that faces the West African economic development. 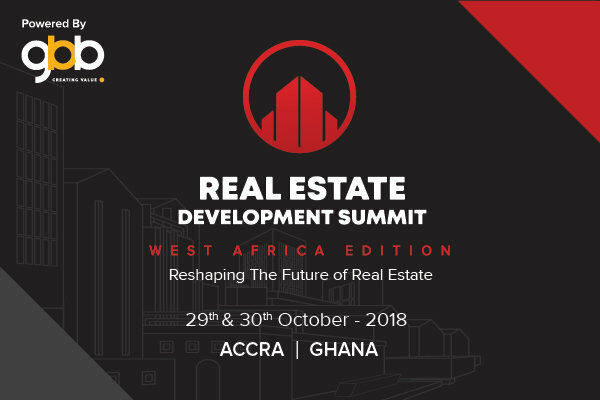 To bridge this gap, GBB is hosting 2nd Edition Real Estate Development Summit – West Africa on the 29th & 30th October in Accra, Ghana at The Kempinski Hotel Gold Coast City. This initiative aims at bringing together various leading Buyers and Suppliers from global markets under a single roof to enable meaningful and productive exchange of knowledge, opportunities and ideas amongst each other. GBB believes that this is a great opportunity to find profitable and efficient solutions to the Real Estate sector’s challenges in West Africa. Our focus would be to identify the challenges faced by the Developers while sourcing appropriate Solution Providers and other real estate project related solutions and connect the local business owners to leading global market leaders who are handpicked based on decades of accumulated experience in the industry. To know more about the RED Summit Contact us today at marketing@gbbventure.com.